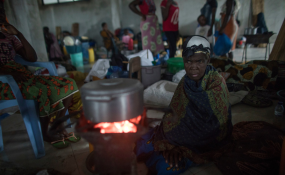 In the city of Beira, in Sofala Province, Central Mozambique, a Category 4 Cyclone named Idai made landfall wreaking havoc knocking out power across the province and impacting every resident. Under the leadership of Mrs. Graça Machel, GMT, NMCF and FDC have joined forces to mobilize resources to contribute to the emergency relief effort as well as the rebuilding of the lives of children, women, communities that have been devastated by Cyclone Idai. We make a special appeal to the local, regional and international partners to contribute to our efforts in cash or in kind. For further information on how you can help, please contact the following. The Nelson Mandela Children’s Fund aims to give voice and dignity to the African child by building a rights-based movement. Kindly note that the list of the required priority list and services is attached to this statement as Annexure One. Copyright © 2019 GraÃ§a Machel Trust. All rights reserved. Distributed by AllAfrica Global Media (allAfrica.com). To contact the copyright holder directly for corrections — or for permission to republish or make other authorized use of this material, click here.